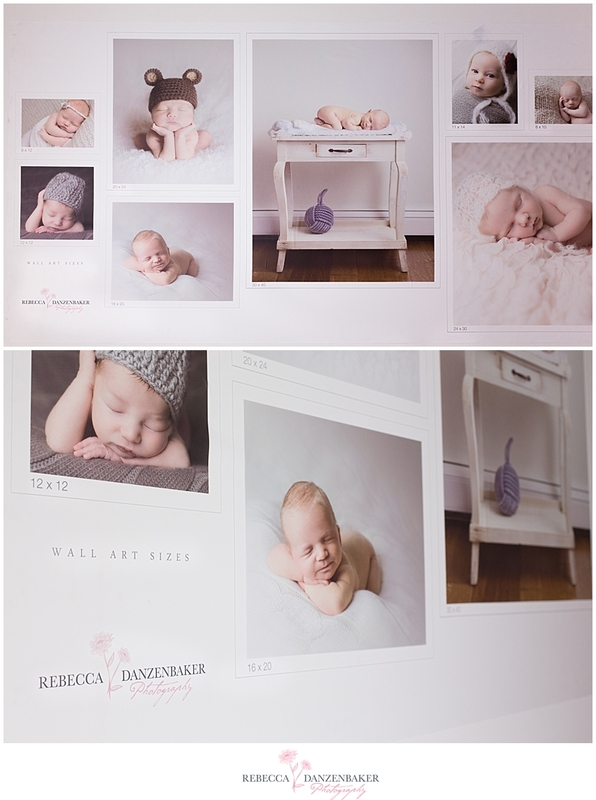 My newborn photography studio is finally finished! I officially opened my home boutique studio on January 19th, but the last finishing touches were added on Friday (then I left town for a couple of days for my birthday) so you now get to see it! This has been a long-time dream, and I’m so excited to share it with you! Though it was designed specifically with newborns in mind, I can also use this studio for children up to two years old. We can even do cake smash sessions for one-year-olds with a white seamless backdrop! Okay, enough talking… here it is! Straight ahead of the entrance, there’s a table displaying some of my photos and holding some goodies. Above the table, is one of my two favorite things in the studio – a custom-designed frame from my friend, Jayne, of Sugar Bea Art! I love how unique it is! The two quotes are from Jane Austen – “Till this moment, I never knew myself” and “Indulge your imagination in every possible flight” – both from Pride & Prejudice. 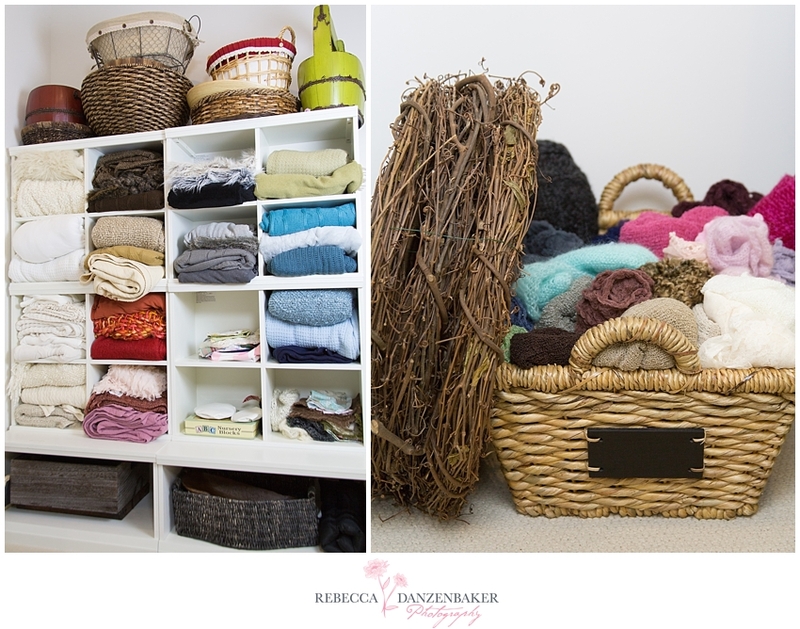 To the left of the table and frame, you’ll find a cozy couch and lots of blankets and props! That wall cling above the couch was a complete pain to put up. It’s like one giant sticker! At one point, it collapsed on itself into a small ball and we had to stretch the entire thing out again. That blue mark at the top is from my jeans when I was kneeling on a corner of it to stretch out a wrinkle in the middle. Hey, it’s a story now! It shows the various sizes of prints so that you can tell what they look like when they’re up on a wall. I bought the template for the wall cling from Design Aglow. Thanks to my awesome hubby for helping me put it up and keeping me calm as we unfurled the great big sticker ball. But here’s where the magic happens! Two different setups to the left of the changing table. 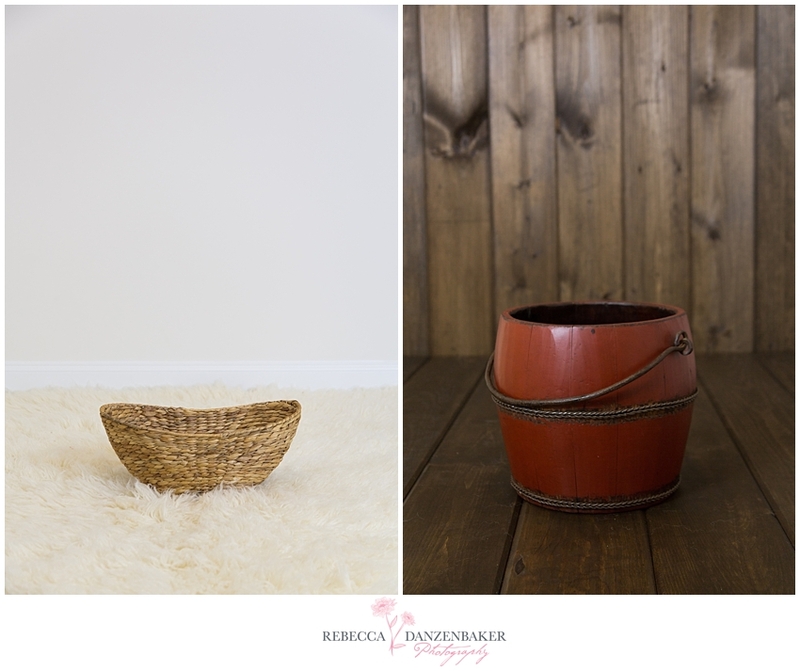 This is also where I set up the newborn bean bag and the blanket backdrops. 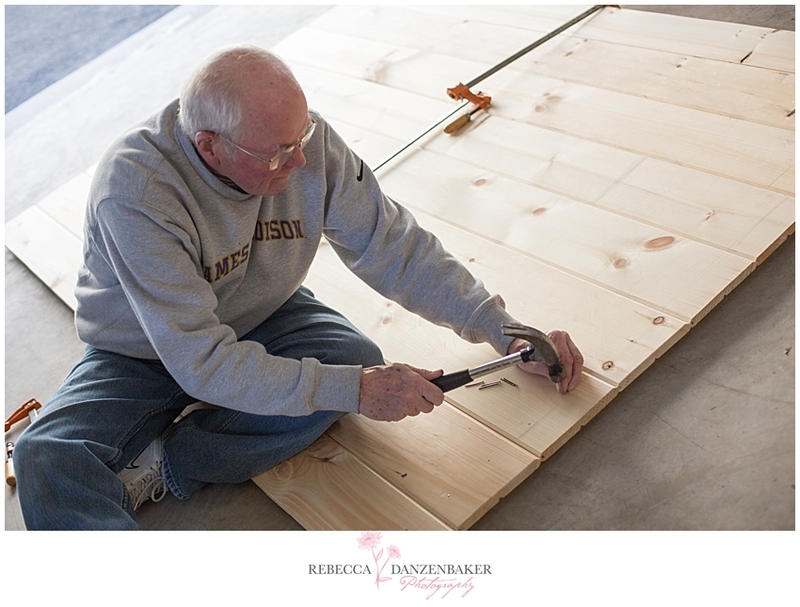 The wooden backdrop was made by my father-in-law last week! It’s the other one of my two favorite things! Here’s an action shot! I did the amazing staining afterwards. 😉 Yay, me! Imagine your cute little baby here! Her slideshow was found by Photodex, who I use to create my slideshows, and they asked to feature her slideshow on their blog! It was published on February 8th! Read it here! 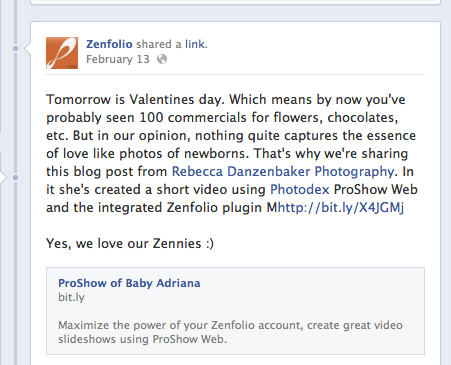 Then Zenfolio, who I use to host my site, found that blog post, and did a shout out to me on their Facebook page on February 13th! Sweet! All of this, combined with hanging out with my family, helped to make for an excellent birthday for me (Feb 16th)! 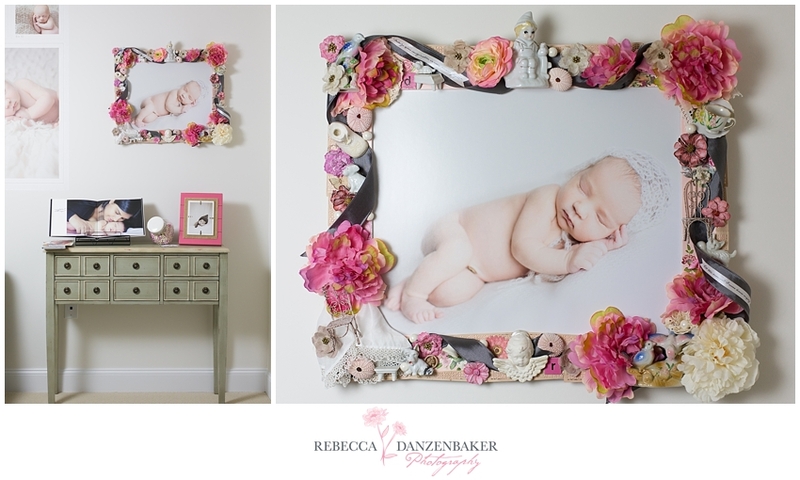 Can’t wait to share even more newborn photos from the studio! Follow my work by signing up to receive my blog in your inbox below and also visit my Facebook page to Like me! Thanks! Thanks, Natalie! Wish you were here so that I could photograph your son (to-be!) and little girl!!! Next time you’re in town, let me know! 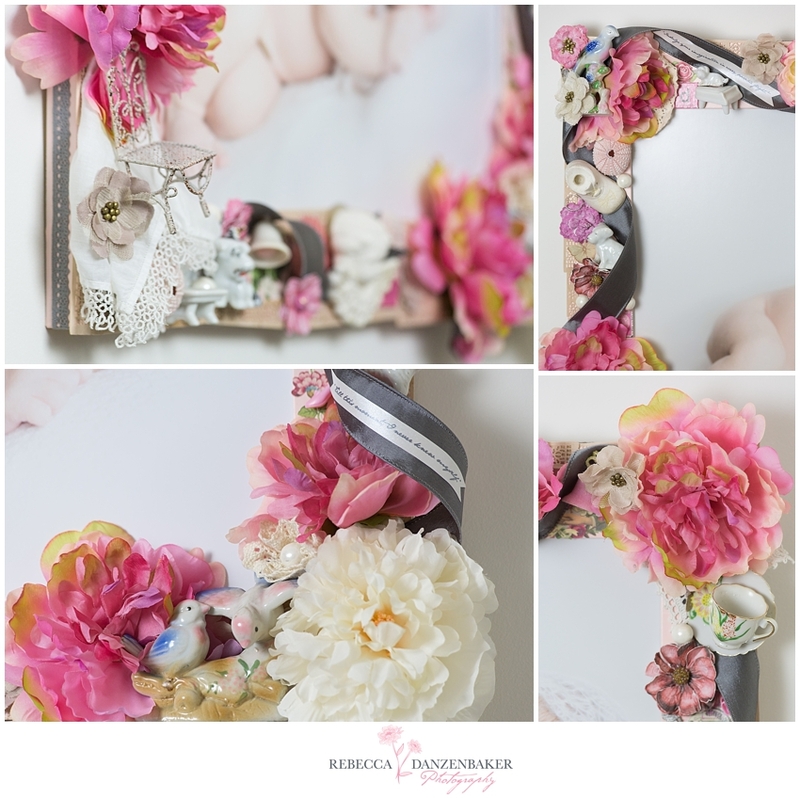 Absolutely beautiful, Becky! I’m so proud of you! You’re studio looks amazing!!! You almost make me want to have a child. Maybe in a couple years…I will surely think of you, when I want to have some photos of my little one 🙂 I am happy you are living out your dream…very inspirational. I always wanted to open up my own business (Children’s Clothing Boutique), any advice for an aspiring small business owner? Hi Latoya! Thanks so much! I learned so much when I took a three-day business for photographers class. It really opened my eyes up to everything I needed to do to ensure my business would be sustainable from year to year. It was great! So maybe something like that. I also think you need a fabulous photographer to take photos of little kids modeling your cute clothes. Wink wink!!! but I had to ask! Much appreciated! Your studio looks awesome! I love the wood backdrop! Would you mind sharing the dimensions and type of wood your father-in-law used? I wish he could come to Texas to build one for me!! Hi there….I missed your webinar for the Art Institute of Pittsburgh on-line for extra credit. I have been dealing with the sudden and untimely death of my youngest brother, last night some thugs broke into his place and tried to steal some of his personals and I was too concerned for my elderly mother (76) who went after them with a pistol before the sheriff could arrive. I was wondering if the webinar was recorded as I need the extra credit since the first 2 weeks of class was rather strenuous with the heart-wrenching reality that my brother had a heart attack at age 43. Planning funeral and visitations far away from my own computer and online classroom has really hindered my grades. Oh, by the way, I am also a photographer with In His Hands Creations photography in Berea, KY. I generally do Senior Portraits, Engagements, Weddings, Proms, and special events. Infants are the only area that I feel I really need a boost as far as posing and etc. I love your work and totally love your beautiful studio. One day, I keep telling myself, I will have my own studio. Currently, I try to do as many on-location sessions that I possibly can. It is what most Seniors prefer. On another note, I am eager to get started on some newborns and watching you has really inspired me. This is absolutely beautiful. I hope to one day have a room to have my studio. Also…wondering if there are any windows? Or is this a basement? And i would really like to know where you got that wall cling! It’s a great idea! 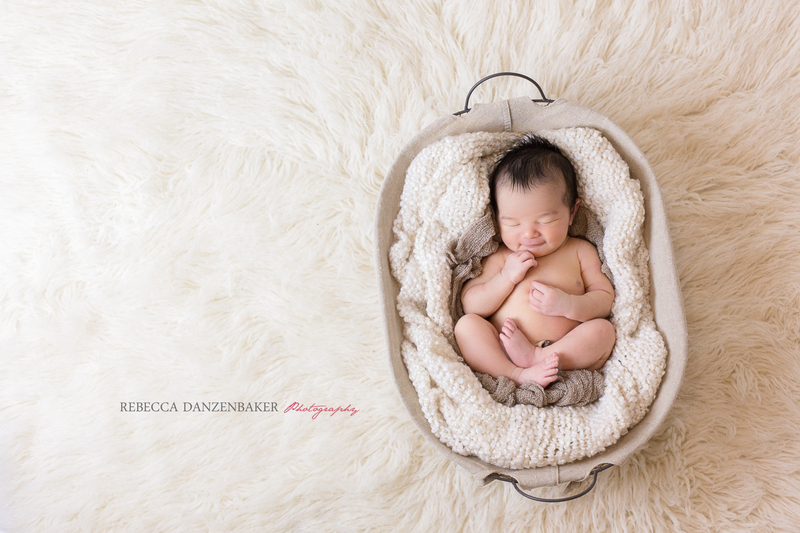 Do you take classes to teach new born photography?